Like an amoeba the public cloud is extending fingerlike projections to the edge in a new kind of architecture that creates a world spanning distributed infrastructure under one centralized management, billing, and security domain. This issue—the deep nature of centralization—came up as a comment on my article What Do You Believe Now That You Didn't Five Years Ago? Centralized Wins. Decentralized Loses. Centralization can refer to the locus of computation, but it also refers to a boundary, to a domain of control. Facebook, Netflix, and Google are all distributed across much of the world, but they are still centralized services because control is centralized. You know this because in a browser, no matter where you are in the world, you navigate to facebook.com, netflix.com, or google.com, you never enter the URL for independent shards, yet all your data and services magically follow you around like a hyperactive puppy. That's the world we've come to expect. That's how services built on a cloud work. 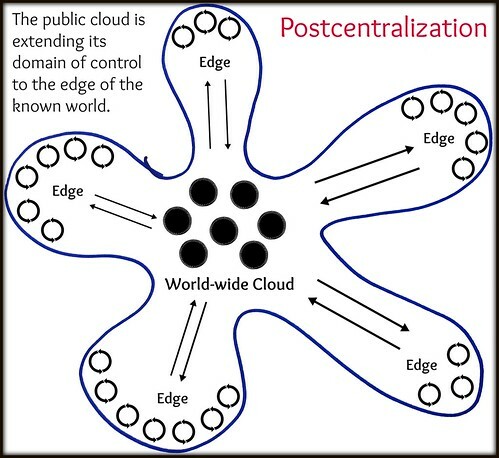 With cloud based edge computing we've entered a kind of weird mushy mixed centralized/decentralized architecture phase. Amazon let's you put EC2 instances at the edge. Microsoft has Azure IoT Edge. Google has Cloud IoT Edge and GKE On-Prem and Edge TPU. The general idea is you pay cloud providers to put their machines on your premises and let them manage what they can. You aren't paying other people to manage you're own equipment, the equipment isn't even yours. Outsourcing with a twist. Since the prefix de- means "away from" and centr- means "middle", maybe postcentralization, as in after the middle, would be a good term for it? Even VMware is getting in on the act, pushing for their own vision of a hybrid cloud at the edge. You can learn more about how Google thinks Centralized Control, Distributed Data Architectures Work Better Than Fully Decentralized Architectures. What's new in the world is thinking the edge can be part of the public cloud. The edge has always been considered its own proprietary domain. Not anymore. We may have had visions of public cloud edge computing as a rack of equipment in a manufacturing plant, interacting locally with sensors for low latency command and control, but the vision is broader than that. The public cloud wants to extend and embrace all computing. You might be surprised that a company like Chick-fil-A is a candidate for this new style of edge computing. Chick-fil-A runs Kubernetes at the edge with 6000 devices in 2000 stores at a cost of $900 per cluster. Does Chick-fil-A want to run all of this themselves? Probably not. It's easy to imagine a box dropped into each Chick-fil-A that acts like an all-in-one branch office router, SDN node, gateway and firewall while locally providing services like WiFi, point of sale, device command and control, ML, security, phone service, etc., but is seamlessly managed like another availability zone in a public cloud. Want to release new software? It's no different than how you do it in the cloud now. Security? It's no different than how you do it in the cloud now. Want to look at logs? There they are. Whant to attach a function to an event? Go ahead. A device in the box goes bad? Thats' on the cloud provider. This is the thin edge of the wedge into the enterprise and everywhere else.